The new Blakes 7 audio adventures are now available on the Sci-fi channel website. Currently there are 3 episodes available, each running at around 5 minutes each, with new episodes released 3 times a week. And if its your thing, they have a downloadable wallpaper for your desktop. 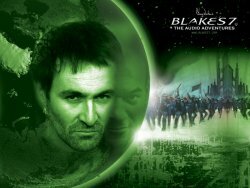 The Blake7 episode of 'The Cult of...' will transmit on 12th December 2006 8.30pm - 9.00pm. Blakes Junction 7 will not feature in this documentry. Our users have posted a total of 50386 articles. We have 6072 registered users. The newest registered user is NaomiJ . In total there are 71 user online. We hope you enjoy your trip through our pages and that you come back soon! Blakes 7 was created by Terry Nation. or creators of Blakes 7 and is totally unofficial.